Opening Friday, June 10, 2016 from 6­-10 pm with live music: Low-reen & the Maxwell St Market Blues Band, featuring Killer Ray Allison, Rasheed Stewart Muhammad, & Chris Alexander. MAXWELL STREET’S LAST HOPE will explore the meager resources that remained available in the 1990s to the once thriving community of the Maxwell Street Market neighborhood. In 1989, a master plan published by the University of Illinois at Chicago made it clear that expansion south of Roosevelt Road would ultimately consume the Maxwell Street neighborhood and displace its world famous open‐air street market. In response, preservation and community activists came together to defend the spirit and built fabric of a place that had persevered economically and socially for nearly a century due to its character of entrepreneurship, cultural diversity, and resilience. Photographs by Ron Gordon and Lee Landry document this historically pivotal time, and a multimedia assemblage by artist Nicholas Jackson recalls the struggle. Lee Landry is a photojournalist, a Unit Still Photographer for film productions, and a long-standing illustrator. He is also a traveler and has traveled half way around the world with camera in tow. In his images, he documents almost everything he does and his experiences similar to the way of a writer. 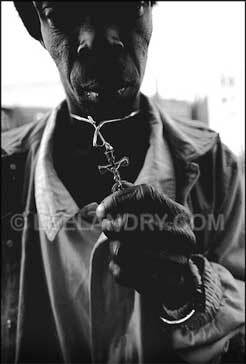 Having been published in various magazines, newspapers and books, Lee took aim at the Maxwell Street Market in the 1990s and developed a photographic project series entitled: Maxwell Street: The People. Well-known for its food, its stores, blues music and the market itself, Lee photographed the people who lived and worked there that few knew about: the people of Maxwell Street. Lee is on the board of directors for the Maxwell Street Foundation. Ron Gordon is a photographer and preservationist whose work includes the documentation of Maxwell Street buildings, its streetscape, and sometimes the people who resided there. Having lived in Pilsen for 30 years, Ron’s work frequently focused on Chicago’s south and west sides. During 1995-1996, he was commissioned by the University of Illinois at Chicago to prepare the photographic work for the Level 1 HABS/HAER documentation required by the federal government for the Maxwell Street area redevelopment. He also photographed an iconic image of one of the last buildings’ demise on Maxwell Street during a fire on the eve of the Millennium, now published in City 2000: words and images about Chicago and its People. Quoting Ron, “Often I have been the last person to document something as it was about to disappear. This visual record of changes in the urban landscape is also social documentary, since architecture cannot exist without people, or people without architecture.” Ron earned a BA in language and literature (1965), an MA in literature (1968), and completed preliminary doctoral studies in language and literature at the University of Illinois. He is the recipient of a Fullbright travel grant and two Focus Infinity Fund grants, and owns the Ron Gordon Photographic Services photo lab. His work is included in the permanent collections of the Art Institute of Chicago, the Chicago Historical Society, the Museum of Contemporary Photography, the Illinois State Museum, the Paris Art Center, and the Library of Congress. He has co-authored with John Paulett two books for Arcadia Publishing, Inc., “Printers Row Chicago” (2003) and “Forgotten Chicago” (2004). In March 2016, Ron relocated to North Carolina with his wife Sallie. Ron has gifted a substantial quantity of his photographic work to the Maxwell Street Foundation documenting Maxwell Street’s transition. Nick Jackson is a photographer, illustrator, and writer concerned with the intersection of personal and regional histories. Nick spearheaded a StoryCorps partnership with the Maxwell Street Foundation in 2015 recording the oral histories of people associated with the market, its music, and neighborhood. From 2012 to 2014, Nick served as a Peace Corps volunteer in a rural Ukrainian town where he taught English and art classes. Since returning to Chicago, he has continued teaching as well as producing illustrations and comics. These include Falling Rocks, an illustrated narrative of the protests in Kyiv that he presented in the “Brain Frame” performative comics reading series. He is currently a finalist for a Fulbright study grant that will possibly send him back to the Ukraine next year. Nick holds a BFA from the School of the Art Institute of Chicago, and is on the board of directors for the Maxwell Street Foundation. All images published by the Maxwell Street Foundation within this website are copyright of the artist and are for educational, personal, and/or noncommercial use only. For any other use, please contact gro.n1555620166oitad1555620166nuoft1555620166eerts1555620166llewx1555620166am@of1555620166ni1555620166.